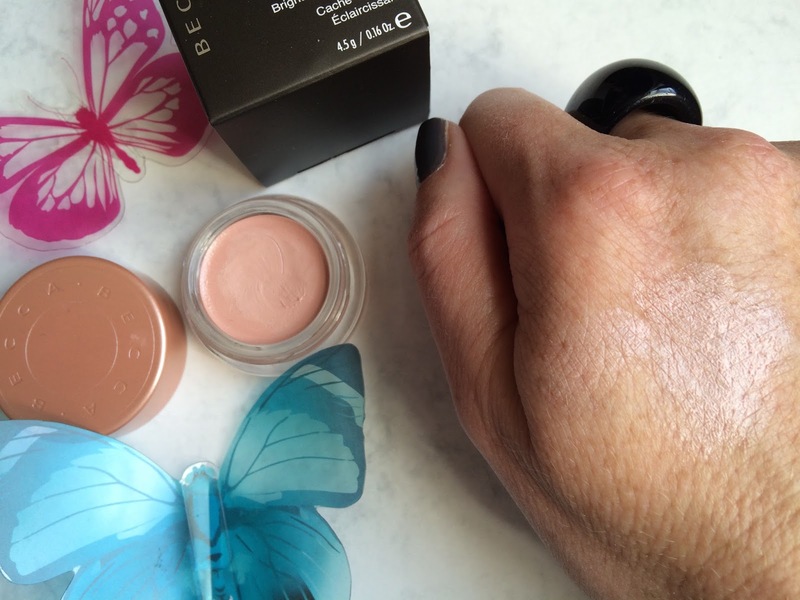 Let me introduce you to the BECCA under eye brightening corrector. Could this be the answer to my prayers in the under eye department? I got wind of this this from the lovely Tracey at Face Up Beauty. It's been around for a little while but I missed it, story of my life! 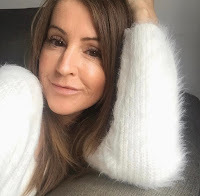 For a long, long time I used the YSL touch éclat and it served me well, but over the last couple of years, due to heavy medication the skin around my eyes had become very dehydrated and lined and because of that I found it didn't suit my needs anymore. So, I thought I'd give this beauty a go, anything that can make me look half alive has got to be good! It has a really creamy texture, almost like a balm, I think that's what drew to me to it most. The shot above makes it look quite peachy but it has a more pink tone to it, quite pearlescent, like in the photo below. Considering it's quite thick it's easy to apply and with a satin finish is really workable on my dry skin, no pulling or dragging. I pat a thin layer to the inner corner of my eye with a clean ring finger and blend outwards, also putting a little under the lower lash line. It instantly makes me look wide awake, adding a bit of oomph to my face! I would class this as more of a highlighter though rather than a corrector/concealer type product. I do use this on its own and it does well at hiding slight discolouration but if you suffer with dark circles then I don't think this will be enough on its own for you, you'll need to combine it with your regular concealer. If you're doing that some say to put this on first followed by your concealer but I would personally do it the other way round as it would hide any brightening effect you've created, and for me thats what I'm after, brightness, radiance and luminosity. You get ALL that with this product in my opinion. The test for me was seeing how it would fair on a day at work. With other concealers I'd go to powder my nose towards the end of the day and any concealer would be dry and caked in my lines, making re-applying a bit of a nightmare and if I tried it would only look worse! However, not so with the BECCA highlighter/brightener. There was minimal caking, if any, and if there was, because of its consistency I would just blend it away and re-applying was no problem at all, in fact I always applied more at lunchtime, loving that it made me look awake at work!!! I'm quite fond of the little pot it comes in, a bit like the eyeliner pots and I know it's small but trust me when I say this will last forever as a little goes a long way. Word of warning though the pot is glass so don't drop it!!!! I've given this a good run for its money and I'm so glad I tried it. I LOVE IT and could not go out without it. Seriously. If you fancy giving it a whirl then you can get it online from here or here. On another note, I'm on the hunt for an under eye concealer for my really dry, wrinkle-prone skin :( so if any of you have any suggestions I'd love your help! What under eye products do you use? Do you like the look of this one? Ooo this looks really nice - Im all for products that you can apply quick and easily throughout the work day! Loving this post (after seeing you on #30plusblogs). If I first to use eye cream for even one day my undereyes get really dry. I use Origins Plantscription eye cream on a morning after Caroline Hirons recommended and its very good under makeup as a hydrator. I've also heard the Terry D concealer is good so I think this recommendation has tipped me to buy it. I currently use a Collection one (cheap as, but recommended by LBQ) under foundation (Chanel Les Beiges - love it) which works fairly well. One trick I've only just started to try is a very small dab of jojoba oil after concealer/foundation. First test today and worked well! I like the look of this Steph! I love my concealer but a brightener is something I want to try!! Really interested in this Steph, I like the fact it doesn't look to sparkly. Have you tried any eye gels to sooth your under eye? These are lighter than cream, so they dont get too puffy.